This fortress is built in blocks of stone, she's located to the west of the city and overlooks Pylos. It was built by the Turks in 1573 when they dominated Greece in order to guard and protect the southern entrance of the Bay of Navarino and defend the port and the region. Later she was consolidated by the Venetians during their occupation of Greece (1686 - 1715). She was again taken up by the Turks thence to the famous Battle of Navarino in 1827. In 1828, it was restored by the French who made such diverse edifices as the building "Maison-Barracks". The entire site represents an area of 1566 meters, is offering a magnificent panorama over the Bay of Navarino and the island of Sphactérie. 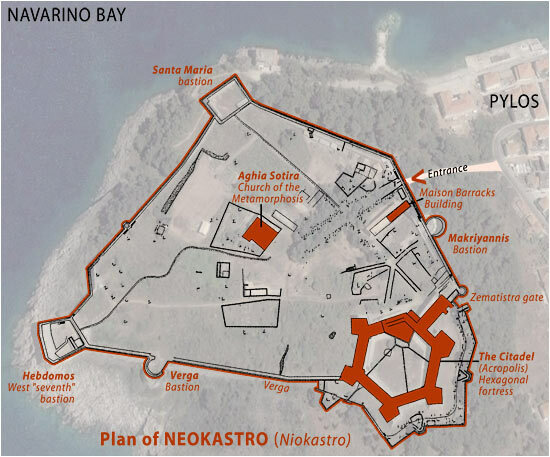 The fortress of Neokastro (New Navarino Castle) is one of the best preserved in Greece. The site is generally open on weekdays from 08.30 am at 15.00 pm. Left-entering: a museum is located in the building "Maison-Barracks", he exhibited memories of the Greek war of independence réunis par le philhellène René Puaux. Au nord, l’endroit le plus élevé: la citadelle, un impressionnant fort hexagonal qui tient lieu d’acropole, avec une puissante tour à chacun de six angles. Au centre: l'église de la Transfiguration (Métamorphosis) est à la base une mosquée construite par les Turcs, qui par la suite a été transformée en église orthodoxe (Aghia Sotiria) par les Grecs. Au sud, surplombant la mer: les remparts sont renforcés par les tours-bastions d'Hebdomos et de Santa Maria. Les remparts, les bastions, les citernes ainsi que tous les "accessoires" encore visibles à ce jour donnent une image claire des efforts de ses créateurs afin de rendre cette forteresse imprenable.